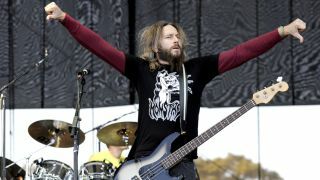 Mastodon bassist Troy Sanders has revealed details of his forthcoming signature Fender bass. In an interview with MusicRadar for our Bass Expo event, Sanders talked about the collaboration with Fender. "The legendary and kind folks over at Fender have expressed the desire and the interest to put out a signature bass for me," says Sanders. "That's easily the most humbling and flattering thing that's ever happened to me in the music business, from an individual aspect at least. "It's going to be a Fender Jaguar bass in Silverburst, which is kind of in the vein of our signature colour for a big period of our career together. It's also the first Silverburst colour scheme that they've done with a signature model. I believe it's going to be Mexican made. That's in the works and it's scheduled to be released to the world in April at the Musikmesse event." "The standard Jaguar's got a lot of knobs and switches, so there's going to be some simplification, because I feel I'm a simple man and a simple player - and a lot of the time in the rock 'n' roll world, simple is better. Flashback any number of years ago and say, 'Hey, one day in the future you'll collaborate with the folks at legendary Fender', well, I wouldn't believe myself." Click through to find the full Bass Expo interview. For more information on Mastodon visit the official Mastodon website.